Their self-portraits surround them. They see themselves as they see themselves up on the wall. 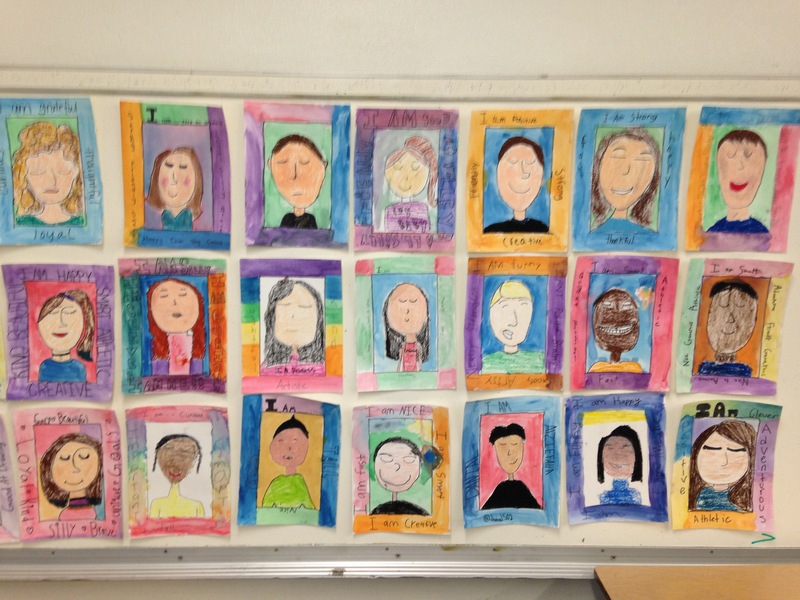 With those portraits looking down, students generated questions to help them dig into their memories of elementary school life and think about what might be next.Memoir writing involves not the memory but the reflection on it. How have others changed me? Even thought the whole point of the lesson was to find your way to reflect, some kids felt compelled to do the “right” thing, Funny how kids so quickly fall into the “do we have to” patterns. Looking at the room, at their faces, it was evident, some just needed space. Others clung to each other to talk and then write. One sort of wandered the room, with a lost look on his face. I asked him if I could help. He looked at me and said, I don’t know what to say. He was physically stuck. For him, it was a simple, “don’t worry” message. Relax, I told him, you have stories. He eventually found a place to sit and write. Yes, I said, it seems anything worth doing isn’t easy. He looked at me. At that moment I thought if he learns anything this year, may it be this. Finally, he said, yeah that’s true. A group of girls huddling on the carpet called me over and told me, D is crying. What?! Apparently, the realization that she would no longer be with her friends left her weepy. “It’s never going to be the same,” T said accelerating the drama. Soon they were a soggy mess on the carpet. The girls on the carpet leaned on each other with pillows, writing on their Chromebooks and in their notebooks. Next week they will share their memories and their dreams. And I’m sure they’ll shed a few more tears. This week I celebrate my students and the privilege it has been to spend a year with them. Every year is a gift to learn with children. Every kid, every year. This week I want to thank each and every one. Thank you, Ruth, for your Celebration link up. Every week this is a place to share and find joy. Find more celebrations here.